The best darned ribs you or anyone else you know will ever taste. 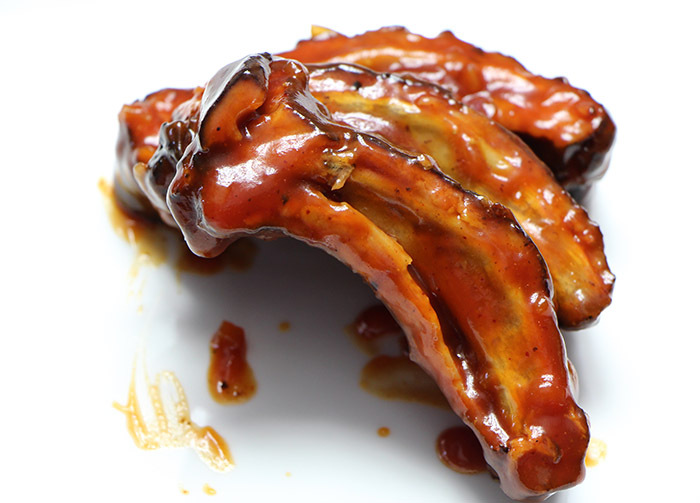 Finished with Chef Phil’s famous bourbon BBQ sauce, these juicy, tasty ribs are always the first thing to go at barbeques! Make sure the silverskin is removed from your ribs*. Generously apply the rib rub to both sides of the ribs and let them sit on the counter for about 30 mins. While the ribs are coming up to temp, light your smoker, gas grill or charcoal grill to a temp of 250 to 275 degrees. You will need an oven thermometer if your grill or smoker is not equipped with an internal thermometer. We like oak, hickory or apple wood chips when it comes to smoking- anything but mesquite, which imparts a bitter taste to meat. You can buy little bags of woodchips at Lowes or Home Depot. The ones you want to use here are around half an inch to an inch square. If you are using a charcoal grill, you will be smoking your ribs using an indirect fire, off to one side, so make sure to build your fire so there is a part with no coals so you can smoke your ribs here. Place your wood chips, soaked in water for 30 minutes, directly on the coals. If you are using a gas grill, make sure the burners are off under where the ribs will be. For gas, place your soaked chips in an aluminum pan, directly over the live burner(s). For an outdoor smoker, you will use charcoal and a log of wood- same kind as above, and once the coals have become ashen you will add your piece of wood to the offset chamber directly on top of the coals. You will need to adjust the airflow with the chimney cap and the side vent to maintain a temp in the 250-275 degree range. One small log of wood is usually enough for the time that we will smoke for! You will need to replenish the chips in either grill once they have burned off during the smoking process. Chef Phil normally replenishes once per session. Whatever the method, smoke your ribs for 1 to 1.5 hours, making sure that your smoking device stays in the 250-275 degree range. Now, preheat your oven to 275 degrees, remove the ribs from your smoking device and put them on a foil-lined baking sheet pan. Wrap the ribs with two layers of foil, crimping the foil on the edges of the sheet pan. Alternately I have used a disposable aluminum steam tray and wrapped that twice with foil. Place ribs in the oven and bake for 1 ½ to 2 hours more, until ribs are tender but not falling off the bone. You can check the doneness several ways. One is with a cake tester: when checking the ribs, the meat should offer very little resistance. Another way is to pick up the ribs in the middle with a pair of tongs. The ribs should be very pliable without the meat falling apart. The last way is to take a look at the ribs that are poking out of the meat. The meat should have pulled back from the bones so the bones look like jack ‘o’lantern teeth! Slice the ribs into single pieces and coat with the BBQ sauce. You can actually leave these for 4-5 hours, in the fridge or not, until serving time… then follow the heating instructions below. Heating instructions: Throw ribs in a pre-heated, 500 degree oven in a hotel pan, or s steam tray covered with foil , for 7-8 minutes or until heated through. *Silverskin is a shiny, white membrane on the underside of a rack of ribs. Depending on where you get your ribs, this may have already been removed- e.g Costco removes the silverskin. If it is still on, you can remove it yourself, or you can ask your butcher to do it for you.